Many saints come with different missions. All of them in one way or another have love, but they don’t always show love, because that’s not their mission. It was Paramhansa Yogananda’s mission. In that mission, he talked of God in a new way, in a way that we are not used to in this country [the U.S.]. He described God, he spoke of God, as the Divine Mother. God is neither Mother nor Father, in a sense. He is that absolute consciousness. But God manifests Himself in different ways. You can say also that God is both Father and Mother. He is unique to each one of us, because as we visualize him, so He will come. What we hold dear, He will show to us. The Mother aspect of God is something that satisfies a deep longing in the heart. We are not satisfied just with a judge; we are not satisfied with intellectual definitions. Without that element of intuition, without that element of feeling, of love, you can’t understand anything, really. Yogananda brought to this country one of the most important gifts he could have given, the idea of worshiping the Divine Mother. I was meditating in Italy and this thought came to me: that we need to stress this aspect of his teaching, this aspect of love, and of love of the Divine Mother — the quality of compassion, the quality of yearning. There was a boy who came to a saint and asked to become his disciple. The saint said, “Come with me.” He took the boy down to the river and held his head under the water. The boy began kicking furiously, and the saint held him there a little longer. Finally, he let him up. “Air! Air!,” the boy gasped. We have to long for God. We have to reach that point where nothing means anything except that. That’s why the best thing you can pray for is devotion, the ability to love God more and more deeply. Yogananda came to bring us that. Remember that no matter what you do God is on your side. He is not going to judge you. He’s going to help you in any way. But you have to let Him help you. On the other hand, He’ll make you work for it. You should ask for love. Don’t even ask for salvation, it’s nothing! So you go to another plane, where you don’t have to eat food, and you don’t have to carry a heavy body around. But they’ve got their problems. Away from God, you have problems, let’s face it. He is the only solution. In heaven, it will get pretty boring until you know what it’s all really about. So, think of God as that who is nearest of the near, dearest of the dear. The really important thing is just that you include Divine Mother in your thoughts, in your heart. Share every thought, every impression, every feeling with Her. Then you will see that in a very short time there comes into your life this sort of symphony, that everything will be floating on clouds of joy. Try it, see if it doesn’t work. 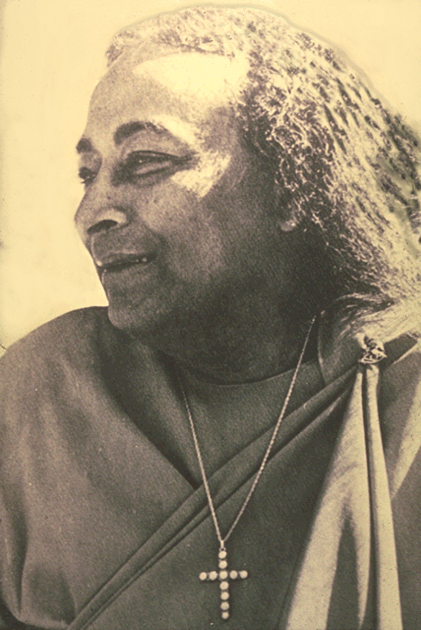 This was perhaps the main thing that Yogananda came to bring to the West, to the world. This entry was posted in cosmic mother, divine mother, kriyananda, yogananda and tagged divine love, divine mother, paramahansa yogananda, swami kriyananda. Bookmark the permalink. I want to know about Kriya yoga. what actually is this..